TORONTO, ON – Following up on last year’s Session Saison, the organizers of the Session Toronto beer festival and The Local 7 craft beer bar collective have announced the release of a second annual collaborative beer. Gose is a wheat ale, traditionally made up of 50-60% malted wheat (ours is 60%, with the other 40% being Pilsner Malt). Lactobacillus Brevis is used which, after fermentation, produces the refreshing sour lemon tartness. The style is quite low in hop bitterness, allowing the Coriander to impart a subtle, dry spiciness and the salt to produce a sharpness on the end. The result is a very refreshing, sessionable and crisp beverage. 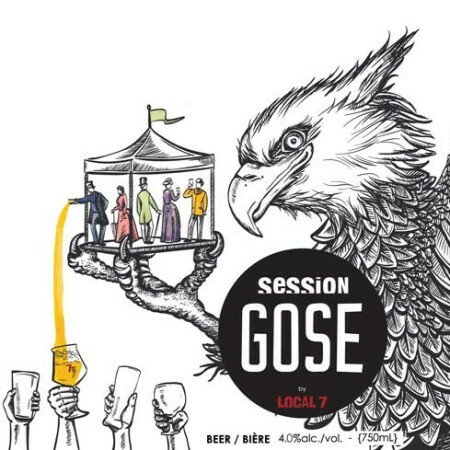 The member bars of The Local 7 – The Only Cafe, C’est What?, BarHop, BarVolo, The Auld Spot, WVRST and Bryden’s – all tapped preview kegs of Session Gose last week, with some offering specially flavoured versions. The full release of the beer is planned for May 20th, when a limited run of 750 ml bottles will hit the shelves at select LCBO locations. It will also be available to sample at the Session Toronto festival, taking place at Yonge-Dundas Square on Saturday June 13th 2015. For more details and tickets, see the Session Toronto website.